We started talking about running and Barbara persuaded me that it would be a good and quick way to get fitter. 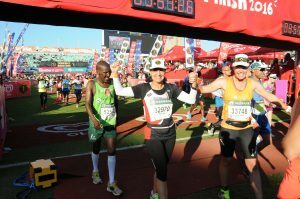 We started with a walk-run programme and with Barbara’s patience and encouragement, and the Truworths Ladies 10km race as my goal, my fitness improved. Race day: together we achieved a sub-60 minutes – one of the best feelings I have had. After that, alongside the weights, cardio, core, and pilates, running was something I did as a matter of course. Fast forward …….. 21 kms races, trails runs, African X 3-day Stage Race, Hout Bay Challenge Race, Fisherman’s Trail Challenge, Table Mountain Challenge, 2011 Half-Ironman, 2012 Full Ironman, 2015 Cape Town ITU Triathlon, 2015 & 2016 Peninsula and Two Oceans Ultra Marathons 2015, and culminating in the 2016 Comrades (aged 52 – I finished in 9:57, 617th female overall and 47th in my age group). The point to this testimonial is not about my achievements, there are many others who have achieved much, much more. It is about starting small and doing it consistently. It’s about doing something every day. It’s about always having goals. it’s about having someone to be there to support you initially: if Barbara was not there waiting for me to show up I would not have gone to gym, nor run that first 10km race. It’s about being able to do these things in middle age, and be able to get better and thereby build strength for when you grow older.